The Pioneer PDP-6010FD Plasma is a current Fall 2007 model. This plasma TV is assembled in the U.S. with components manufactured in Japan and the U.S. Pioneer focuses their manufacturing efforts on top performing plasma televisions. Up conversion from 480i and 480p: Up conversion using our trusty, old and poorly produced Risky Business DVD was very good. There was slight grain and background noise but from 16 feet it was almost unnoticeable. There is a slight flicker when viewing the plasma from closer than 10 feet. The realism was excellent and I thought the Pioneer’s video chip sets cleaned up the picture nicely while staying true to the original content. Reds really popped, and this was a facet of the original production. 720p/1080i/1080p Picture Quality: We reviewed The Last Stand next in the X-Men’s epic line of comic thrillers produced in 2.40: widescreen letterbox format. It’s hard to imagine that television picture quality is going to get any better than this. In 1080i and 1080p the Pioneer 6010FD performed almost flawlessly with stunning clarity, deep rich blacks, vibrant but not oversaturated colors. The post calibrated picture will seem at first softer than normal but you the viewer will enjoy the picture much more over time (and you wont get a headache from all the false edge enhancement). Black Level: Excellent with no down side. The new Pioneer KURO Plasma technology has been focused on presentation of black levels, frankly to catch up with dominant black level producer Panasonic. The blacks are rich and deep and almost the color of the black bezel. Dark Shadow Detail: Stellar performance here. There is occasionally a scene that is overpowered by the black level and loses some dark matter detail, but it’s the exception and not a rule. Color Rendition/Color Accuracy: Color rendition is near perfect to the source material. I have never seen better. Viewing Angle/Off Axis Viewing: Perfect. This generally is not a problem with plasma. Motion Lag: No motion lag at all. False Contouring/ Mapping: Historically a problem with both plasma and LCD technology. It’s virtually non-existent on this plasma. Scaling: Aspect ratios are controlled by the Screen Size button on the remote and include a very full range labeled as full, zoom, cinema, 4:3, wide. The algorithmic scaling of the full aspect was excellent for DVD use. Inputs: 4 HDMI Inputs assist in an overly complete input selection which includes 15 pin VGA for computer. Aesthetic Considerations: This plasma is very attractive with the gloss black bezel. However since the bezel is perfectly face flat to the viewer – it does present glare problems which I found distracting. Remote Control/Menu Functionality: Preset color temp options controlled by the AV selection button are critically important for the users distinct setting options. Since the different inputs do not allow discrete set up, the user may use the different color temp options to discretely control the different source signal color information. Options include Standard, Dynamic, Movie, Game, User, Optimum. The remote control is complete with glow in the dark buttons. One big plus here is discrete input selection buttons. Audio Output: The dual 17 watt speakers produce solid sound quality. Features: This plasma television has a ton of extra features. TV Guide On Screen, very complete well-written manual among others. Exceptions: Very slight buzzing noise from fan less cooling system. Price Considerations: Prices for the Pioneer PDP-6010FD are all over the place but a few authorized online dealers have them for around $5000 though most are in the $6000 range. It’s expensive but there isn’t much selection at this size range. 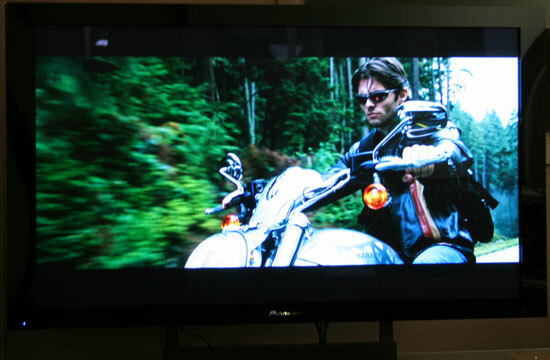 As well, nothing but the Panasonic 65” plasma competes on quality. Quality Comparison: The only true competition is Panasonic’s and Samsung’s top tier plasma products along with possibly the Sony XBR4 and 5 series LCD. However, in my opinion this Pioneer outperforms them all.